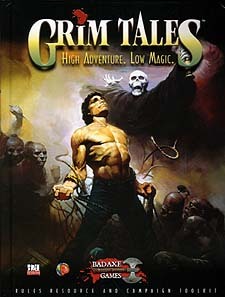 Grim Tales is the high adventure, low magic campaign sourcebook for fantastic roleplaying in your favourite pulp genres, from the dawn of Atlantis to the apocalyptic future of a dying planet. Players will enjoy nearly limitless combinations of classes, feats, skills, and talents to create their characters, while GMs can pick and choose from a wide variety of design mechanics, variant rules, and campaign trappings to create exactly the setting he wants to challenge and entertain his players. Grim Tales is a complete toolkit, allowing you to create exactly the games you want to play. It is designed to be completely compatible with your existing library of d20 products, allowing you to use feats, skills, equipment, spells, monsters, and even entire settings from nearly any source.